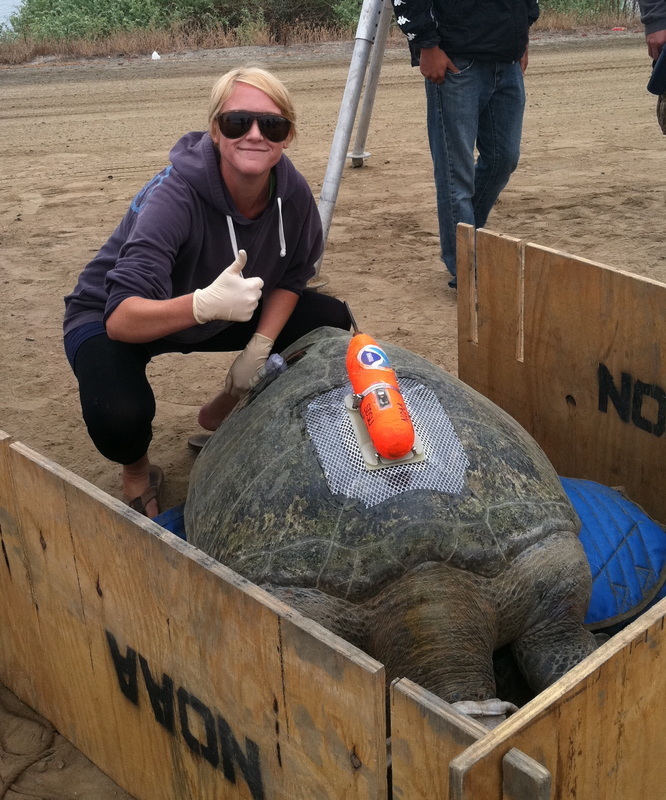 Sheila attaching a Time-Depth Recorder (TDR) to an adult green turtle (Chelonia mydas) from San Diego Bay, San Diego, CA. NMFS Permit #1591. I grew up in Berwyn, Pennsylvania, a suburb of Philadelphia, but spent my summers at the beaches of Ocean City, New Jersey and Cape Hatteras, North Carolina. During these summers I developed a deep love for the ocean and its inhabitants, declaring at a young age that I would be a marine biologist one day. Well, as it turns out, I am actually en route to becoming a marine ecologist (minor detail). Marine turtles, in particular, have captivated my attention for as long as I can remember. But it was during my freshman year at the University of Vermont where I became aware of the impressive movements and migrations of marine turtle species. The one challenge was gaining research experience with marine turtles while completing my degree in Vermont; apparently there are no marine turtles in Lake Champlain...Nonetheless, I persisted and gained laboratory research experience looking at mammary gland development in fetal pigs supplemented by a summer internship tagging loggerhead sea turtles in Cape San Blas, Florida. My undergraduate advisor, Dr. Russ Hovey, often reminding me that sea turtles DO NOT, in fact, have mammary glands. I went on to complete a Master of Science degree in the Biological Science department at Florida Atlantic University (FAU) in Boca Raton, Florida working with Drs. Michael Salmon and Jeanette Wyneken. Through their guidance, I feel I truly gained insight in what it takes to "make it" as a scientist. And through hurricanes Katrina, Rita, and Wilma I experienced the trials and tribulations of relying on nature to cooperate with scientific research. Upon completion of my MS degree, I took a position as Biological Science Technician in Flagstaff, Arizona working with Dr. Jeffrey Lovich. During this time I worked on a population study of Sonora mud turtles (Kinosternon sonoriense) at Montezuma Well, Yavapai County, Arizona and a population study of desert tortoises (Gopherus agassizii) at the Mesa Wind Park, Riverside County, California. Through these research experiences, I solidified my goal to continue with my graduate studies and attain a doctoral degree somewhere in the biological sciences. The decision to apply with Dr. Rebecca Lewison was a natural one given the conservation focus of her research and after having heard her speak while I was a graduate student at FAU. In addition to working with Dr. Lewison, I have the pleasure of also working with Drs. Jeffrey Seminoff and Tomo Eguchi from NOAA's Southwest Fisheries Science Center. With our powers combined, I am studying movement and thermoregulatory behavior of a small population of Eastern Pacific Green Turtles (EPGT) in San Diego Bay, San Diego, California. Turtles with sonic tags. NMFS Permit #1951. Since 2009, I have been tracking the local movements of green turtles in San Diego Bay through a collaborative effort with the NOAA Southwest Fisheries Science Center, the United States Navy, and the Port of San Diego. 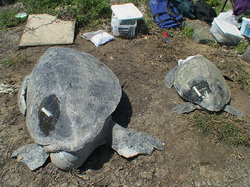 Green turtle movement is monitored using a combination of passive and active acoustic telemetry. The data collected via acoustic telemetry provides information with regard to how green turtles utilize the horizontal plane of their habitat. To monitor green turtle movement in the vertical plane, I am using archival time-depth recorder (TDR) tags (see photo above). A TDR is temporarily mounted to the carapace of a green turtle to monitor the dive behavior of the turtle. Upon release from the animal, the TDR is collected and data retrieved from the tag. All tagging and tracking of green turtles in San Diego Bay is consistent with methods approved by the National Marine Fisheries Service (permit #1591) and the San Diego State University Animal Care and Use Program/IACUC. MS in Biological Sciences from Florida Atlantic University. Graduated 2007. BS in Animal Science from the University of Vermont. Graduated 2005. Biological Science Technician. Southwest Biological Science Center, United States Geological Survey (USGS), Flagstaff, Arizona. March 2008-present. Sonora mud turtle (Kinosternon sonoriense) population study and desert tortoise (Gopherus agassizii) population and fire ecology study. Columnist. Arizona Daily Sun, Flagstaff, Arizona. Writer for a weekly column called “Animal Instincts” covering animal- and environmental-related topics. September 2007-December 2008. Master's Thesis Research. Department of Biological Sciences, Florida Atlantic University, Boca Raton, Florida. Comparative study of early migratory behavior of hatchling loggerhead sea turtles (Caretta caretta) between the east and west coasts of South Florida. August 2005-May 2007. Undergraduate Research. Department of Animal Science, University of Vermont, Burlington, Vermont. Mammary gland development in terms of mammary cellular proliferation in fetal porcine. September 2004-May 2005. Intern. Florida Cooperative Fish and Wildlife Research Unit (University of Florida), Cape San Blas, Florida. Loggerhead sea turtle nest monitoring, tagging (flipper/PIT), and stranding. Summer 2004. MacDonald, B.D., S.V. Madrak, R.L. Lewison, J.A. Seminoff, and T. Eguchi. Fine scale diel movement of the east Pacific green turtle, Chelonia mydas, in a highly urbanized foraging environment. Journal of Experimental Marine Biology and Ecology 443: 56-74. Madrak, S.V. and D. Dodds. 2013. Guardians of the Sea. DEEP Surf Magazine March/April 2013. Lovich, J., M. Agha, M. Meulblok, K. Meyer, J. Ennen, C. Loughran, S. Madrak, and C. Bjurlin. 2012. Climatic variation affects clutch phenology in Agassiz’s desert tortoise Gopherus agassizii. Endangered Species Research 19: 63-74. MacDonald, B. D., R. L. Lewison, S. V. Madrak, J. A. Seminoff, and T. E. Eguchi. 2012. Home ranges of East Pacific green turtles, Chelonia mydas, in a highly urbanized temperate foraging ground. Marine Ecology Progress Series 461: 211-221. Lovich, J.E., S.V. Madrak, C. Drost, A.J. Monatesti, D. Casper, and M. Znari. 2012. Optimal egg size in a suboptimal environment: reproductive ecology of female Sonora mud turtles (Kinosternon sonoriense) in central Arizona, USA. Amphibia-Reptilia 33(2): 161-170. Lovich, J.E., J.R. Ennen, S.V. Madrak, C.L. Loughran, K.P. Meyer, T.R. Arundel, and C.D. Bjurlins. 2011. Long-term post-fire effects on spatial ecology and reproductive output of female Agassiz’s desert tortoises (Gopherus agassizii) at a wind energy facility near Palm Springs, California, USA. Fire Ecology 7(3): 75-87. Lovich, J.E., J.R. Ennen, S.V. Madrak, K. Meyer, C. Loughran, C. Bjurlin, T. Arundel, W. Turner, C. Jones, and G.M. Groenendaal. 2011 Effects of Wind Energy Production on Growth, Demography, and Survivorship of a Desert Tortoise (Gopherus agassizii) Population in Southern California with Comparisons to Natural Populations. Herpetological Conservation and Biology 6(2): 161-174. Lovich, J.E., J.R. Ennen, S.V. Madrak, and B. Grover. 2011. Turtles, Culverts, and Alternative Energy Development: An Unreported but Potentially Significant Mortality Threat to the Desert Tortoise (Gopherus agassizii). Chelonian Conservation and Biology 10(1): 124-129. Drost, C.A., J.E. Lovich, S.V. Madrak, and A.J. Monatesti. 2011. Removal of nonnative slider turtles (Trachemys scripta) and effects on native Sonora mud turtles (Kinosternon sonoriense) at Montezuma Well, Yavapai County, Arizona: U.S. Geological Survey Open-File Report no. 2010–1177. Wyneken, J., S.V. Madrak, M. Salmon, and J. Foote. 2008. Migratory activity by hatchling loggerhead sea turtles (Caretta caretta L): Evidence for divergence between nesting groups. Marine Biology 156(2):171–178.